This is in a bottle that looks a lot like a wine bottle with a label that looks a lot like a wine label, but it has "hop" on the label pretty prominently. It doesn't even say on the label what style of beer this is - it only states that it was aged in chardonnay barrels. I used to dislike beers that were aged in bourbon barrels, but I have found some that changed my mind. Now, I think I'm open to liking a wine barrel beer. 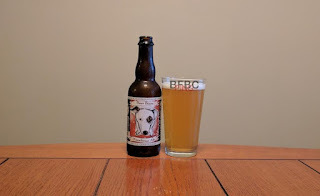 This may also be my first from Nebraska (the state and the brewer). The very hazy orange-gold colored beer has a frothy head that leaves very nice lacing and a very agreeable cap on top. The aroma is of Belgian yeast and some citrus hops. There is a bit of bread in there to add a bit to the others to prop them up a bit. It smells pretty nice. This beer was set aside for me by Jeremy, the greatest proprietor of a liquor store that has ever walked the earth. He knows I like to try new beers, and he thought this would really be in my wheelhouse. It's an IPA, so he clearly knows his customers. This is a local brewery, and City Sliquors appears to really try to get as many local beers as they can get, and I for one am appreciative of their efforts. The heavy haze and thick white head compliment the very orange color of the beer. Lacing is very nice, and you know I like that (if you don't, then welcome to the first review of an IPA on this blog that you have ever read, and I encourage you to read more of them). The aroma is oranges above all else. The else in there is a kind of grass and ... no, it's more oranges. A local brewery! Wait - this isn't local. But it is. First thing I noticed is that this can feels odd. Turns out, it is a plain black can with a sticker on top of it. 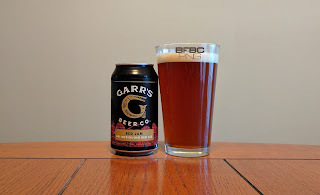 The Tennessee brewery, Garr's, has entered into an agreement to have Straight to Ale brew and can this beer for them, so I assume two sets of beer experts have already sampled this beer and found it to be awesome. That's the kind of beer I want. The beer is a kind of red copper-amber color. Look at the picture, as it is really hard to pin the shade down. The head is pretty good, with tiny bubbles that hang around for quite a while and leave a nice enough doily on top. The aroma is sweet like toffee and caramel. It smells pretty strong, too, and that seems unusual for this type of beer, but I'm game. While I wasn't a fan of the Yee Haw Scottish-style ale, the Dunkel was certainly something to seek out a second time. 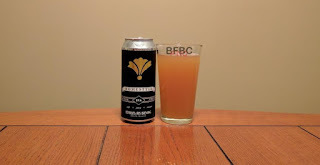 What about a beer that sounds like it should have been made in Boston that is actually made in remote Johnson City, TN? It's northeast of Knoxville, but before you cross the state line to North Carolina. It's pretty close to Bristol, if you are a NASCAR fan. The bright gold beer with the nice and sticky head smells of hops and spices. If there is malt in this thing (which I sincerely hope is the case), I can't smell it. Well, I say that, but it definitely has a sweet smell that is presumably with the bitter hops to tame them, and I can only assume that is coming from the malt, but I swear I don't smell the stuff I normally would associate with proper hops. Another beer from the guy who rides bikes, doesn't drink beer, and is kind to weary beer drinkers who just need one more bottle to get them through the day. This one is the first (and only) that I have in the batch from Lakewood. At first, I genuinely thought that Hinterland, Titletown, and Lakefront were all the same brewery - they have a certain lack of imagination when it comes to label design. The beer is dark, sure enough. 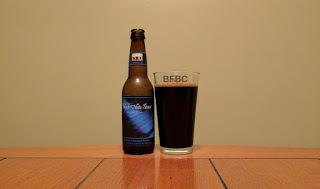 It's not the black of a stout, a porter, or even a black lager. Instead, it is just a deep mahogany with a very light tan head that covers well enough. The aroma is heavy malt with spices dancing around like fairies. I always look forward to a beer, but today has been especially tiring, so I'm looking forward to this even more. Jeremy at City Sliquors was nuts about getting me this beer. As a result, I'm nuts about trying it out. After all, that guy knows his stuff, and he knows what I like (he may be one of the few people who actually bothers reading this blog other than me). So, we have a Catawba beer, and they have been pretty good so far. The last off-the-wall flavor beer that I had was very good, too, so I'm expecting greatness. The hazy, light brown beer has very little head, so there won't be any nice lacing on this glass - so much the pity. 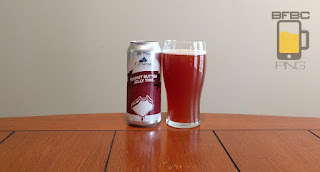 The aroma is peanuts, grains, and raspberries. So, I'd say it's PB&J on whole wheat bread, but it definitely gives the impression of PB&J. This bottle has a big ol' dog on it, so it has me with packaging. There are actually three more little dogs over on the left side of the label, so they are really playing to my sentimentality. Aside from this label detail, I know pretty much nothing of the brewer, so I come into it with no preconceptions, and that means this is exciting. The dusty gold beer has a good enough froth of white head that dissipates into a white lilypad in the middle of the glass. The aroma is funky yeast (smells like bret to me) and citrus. I don't know that I would have picked such a funky yeast for a farmhouse ale, but I'm not the brewer; I'm just the consumer. 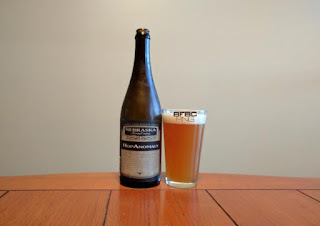 Blackstone has not had the best beer, as far as this blog is concerned. I always WANT beer to be good when I get it, but sometimes I'm just let down. I thought a black IPA might be the way Blackstone could get into my good graces. Let's find out. First things first - this isn't black. I've had my fair share of black beers, and this one is a semi-clear auburn color. The decent sized head goes down to a thin, lightly patchy cap with the usual ring around the outside of the glass. The aroma is much more malty than I would expect from an IPA, but it also sports some citrus and pine. It is a bit light overall on aroma, putting me in mind of a red ale or the like. 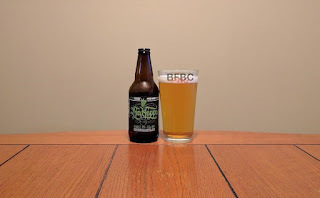 The Hop Nosh from Utah was very good. I'm not sure if there are other brewers in Salt Lake City, but if they start off as good as this one, I'm going to welcome them all (I'm not moving there. Been there once, and ... no ... not for me). Brown. OH so very brown. It's deep, deep brown to its very depths with tiny bubbles that leave a thin cap with some splotchy bits and nice lacing. The aroma is oak, sweet malt, vanilla, and just a hint of bourbon. While beer and liquor should probably stay in their own realms, it's possible I'll find a second one of these that I like. First sip is mild, creamy, and smooth. While this isn't my standard swig, I can tell that the finish is where this beer holds its stuff. The bourbon is definitely sitting there, and the trail-off is dry like a stiff drink. 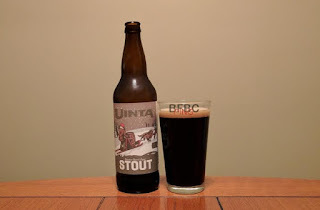 What do I know about Uinta? I know I can't spell it without looking at least twice to make sure I spelled it correctly. I also know that it's the first brew I've tried that is from Utah. No, not Johnny Utah, the young and ambitious FBI agent who figures out that a crew of surfers are actually the true bank robber, but the state. The copper beer has a thick, white, sticky head that is all about being an IPA. It is patchy as all get-out, and it really radiates the air of competence as it pertains to IPAs. The aroma is fainter than I expected, but it has both pine and floral hops coming through in a fairly good mixture - not overpowering on either end. The malt is not really much beyond a faint graininess. Bell's has put out some great beers including the Two Hearted Ale that is one of the best beers I've had. This beer was set aside for me by the reliable proprietor of City Sliquors, as my love of rare and delicious beers is known to him. 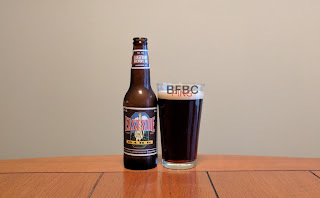 With Bell's, it seems a fair bet I'm going to like this beer. The black beer sports a brown (not tan, mind you) head and absorbs photons in its immediate area. The aroma is very heavy bourbon and oak. 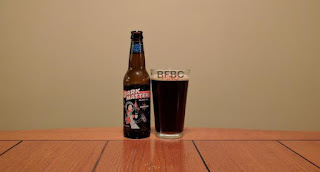 The versions of these bourbon barrel beers that I liked always had it in the background, just coaxing out the other flavors and adding its specialness to them. This seems like it might be a bit too much, but the aroma isn't everything, is it?